So another day begins. This time by Katja going out for water and coming back with two caffe latte’s. Gotta love that girl. 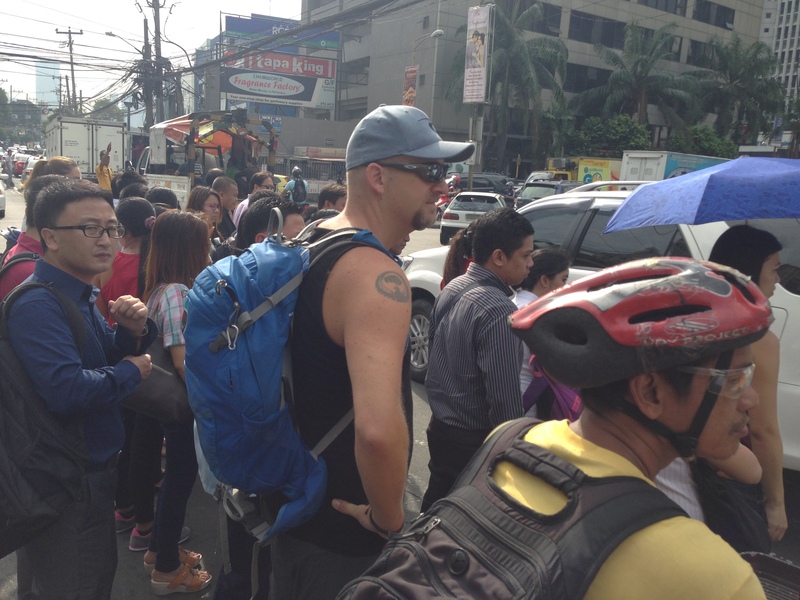 Manila is once again showing itself from a beautiful side with sun and warm weather. As we walk down towards the yoga studio we are doing so together with the locals on their way to work. 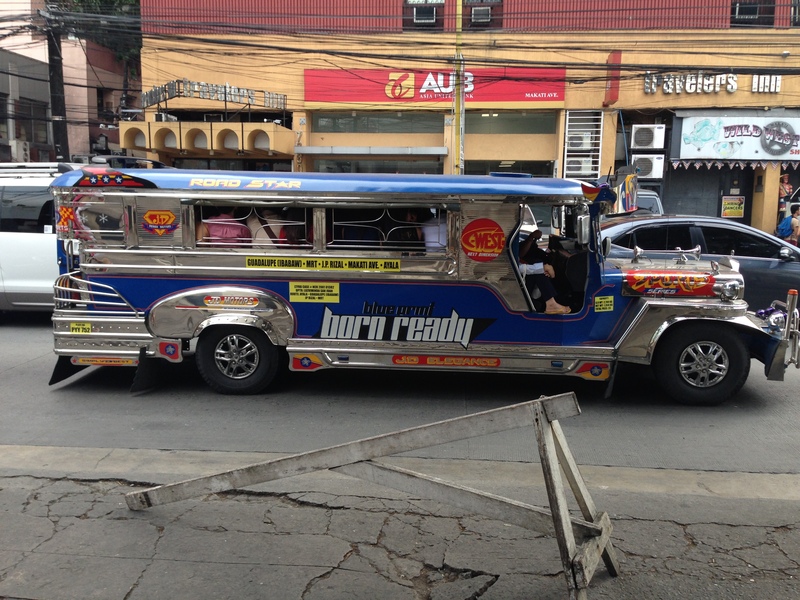 They move in a lot of different ways: on foot, in cars, taxis, jeepny’s and busses. We heard that the amount of work hours wasted in traffic is enormous. This is something that I can relate to. Just waiting to cross the roads takes minutes. The lights changes but cars drive and they drive “hard”. When enough people are present at any one crossing there is a certain energy moving through the crowd and everyone steps out in the street together. This way no driver can take on the big crowd and we all get to cross the road. If you arrive at such an intersection just after the wave has crossed you might be standing for a long time before you get your chance. We did power yoga at Bliss today. The teacher, Jazhel, was very hands on. We were only four in class and she walked around and corrected our poses constantly. For a period I think she lived by my side. The room we practice in is not air conditioned, I mentioned that yesterday. 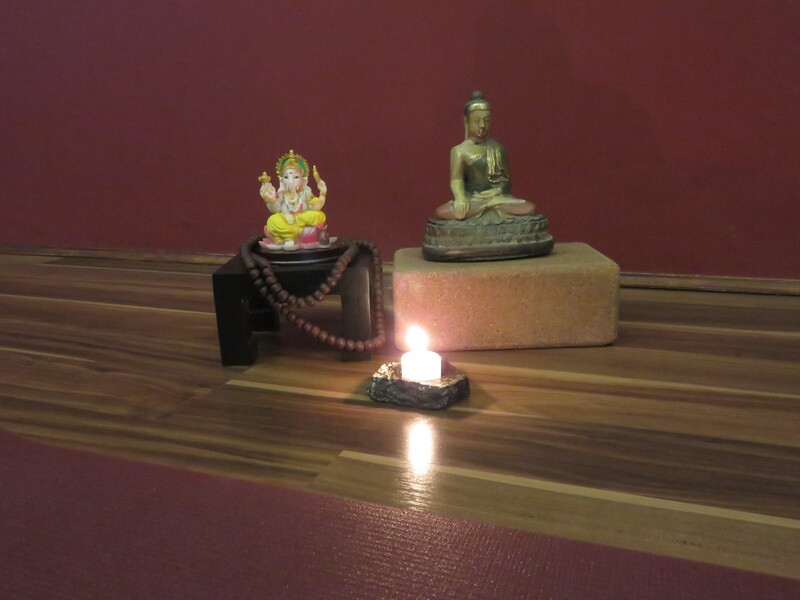 Moving from yesterday’s gentle flow to power yoga meant that much more sweat today. I could wring my shirt and shorts after training, so I didn’t have to carry the extra weight back home. They say sweating when doing yoga is good for you and cleansing for your body. I should be spotless inside by now. We went to the vegetarian restaurant Corner Tree cafe for lunch. I had a pumpkin lasagne with salad. Yummy. It’s actually on my top two or three best lasagnes at all time. Katja ordered “Taro leaves”, whatever that is. “Local vegetable”, was all we got to know when we asked. She liked it, even though it looked like it might have been served once before. We spent much taking about training. What works, how to stay motivated, how one’s reflection can inspire the other. It was a good talk. Then we moved in direction of the hotel, but got sucked in by Century mall. Strange how such places have a gravitational pull on Katja. To be fair I do need some new underwear. The humidity in this town makes it impossible to get by with the number I have with me. I also gonna try to use briefs for a while. Personally I have not used briefs since I was a kid. I’ve been a tight boxer’s man since as far back as I can remember. Still the temperature here indicates that less is more, so I’ll give it a go. In Century mall we found a French bakery. We bought a baguette and a 100% whole grain bread. Next to the bakery was a nice supermarket with a lot of fresh produce and meat. We bought salami and cheese and had a feeding frenzy in the hotel room. We’ve not missed the Scandinavian food much, but bread and butter was just delicious today. After a little while in the room it was time to go to training. We will visit AA (Adrien Pierre N. Quidlat) at his club and do Rapido Realisimo tonight from 19-21. As Katja said:” It’s a 20 minute ride. Better leave an hour before”. Outside the hotel we struggled a while to find a driver who would take us. “To far in this traffic. ” We had just about abandoned hope and ordered a hotel car, to the price of fours taxis, when a driver appeared and OK’ed the fare. Right now we’re sitting in rush traffic just a few streets from the hotel and we’re driving in 0,5 kph. Hopefully we’ll reach the training before it’s over. A reflection the traffic here in Manila: There are traffic lights everywhere but it’s hard to understand which that are taken seriously or not. Sometimes they easily drive through red lights, other times it’s like true religion. On top of this there are so many places that the traffic is so bad that they disregard the lights all together and put in traffic police to direct. It’s a lot of people in this country and one of the largest employment has to be security and police (in all their flavors). While sitting here in the taxi we talk to the driver and learn new stuff. – The traffic is most heavy on Thursdays and Fridays, a little better on…. maybe no days. We finally got to the location of the gym where the training was. Our taxi driver was a bit concerned on our behalf: “hard to get taxi here afterwards.” So we agreed that he would wait for us for two hours and then take us back. For no additional fee. Fernando was our new hero! We got into the gym and was greeted by AA and his students. They were closing in on a grading and was working curriculum towards this. We had a great training that included a Sombrada we have not done before, with Rapido Realisimo’s touch on how to block and how to strike. We focused on correct use of the live hand. From then we moved over to “The four corners” of knife defense, before we did some scenario self defense. For closing we did a cardio-pump-to-knife-defense drill that made all of struggle. Outside Fernando was waiting and we got home by about a third of the time we used up there. We watched a little TV but was really to tired to get a grip on it. Lights out, Amigo. Categories: Philippines | Tags: Manila, Martial Arts, Philippines, Rapido Realisimo, Yoga | Permalink.